Lemonade? A wine cooler? 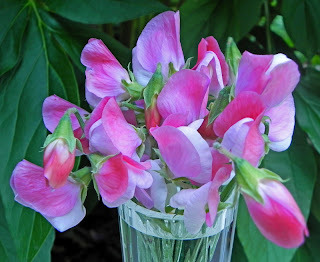 If you're looking for refreshment in the 90-degree heat, try a vase of sweet peas! These delicate beauties don't often fare well in the Midwest, but I planted some in late March and now am very glad I did. I'd have to do some digging to see which varieties I planted, but I'm pretty sure there were only two. The flowers in the photo are all coming on like crazy in part because of the steady weather with highs barely reaching 80 during the day and night temperatures between 50 and 60 degrees. This weekend, the blast furnace returns, so I'll be keeping them well-watered, and pat myself on the back for planting them in a location where they are sheltered from the afternoon sun. 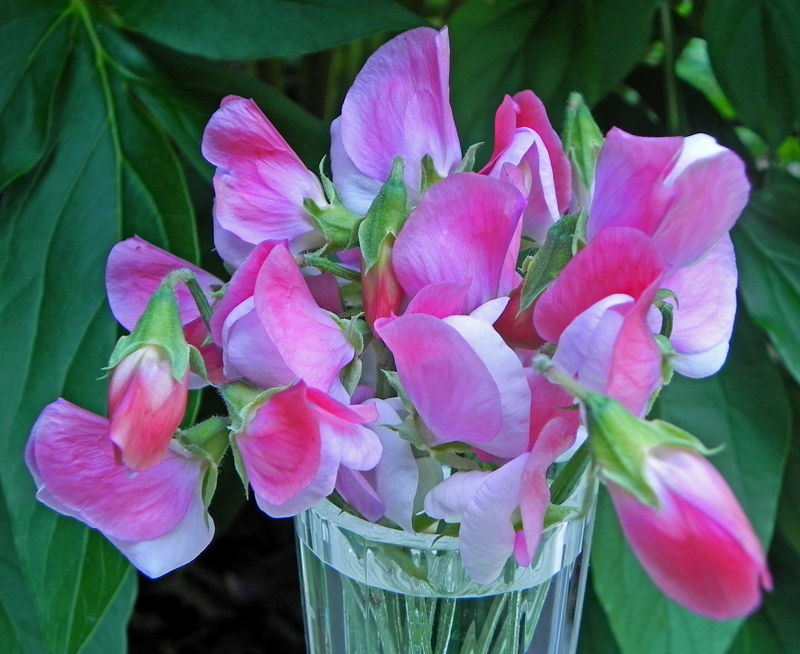 Pick sweet peas often to encourage continuing bloom. I've been cutting little vases of them every other day. They don't last really long in a vase, so every other day is perfect. A little late, but nonetheless ready to bloom, are the stock plants I started from seed. 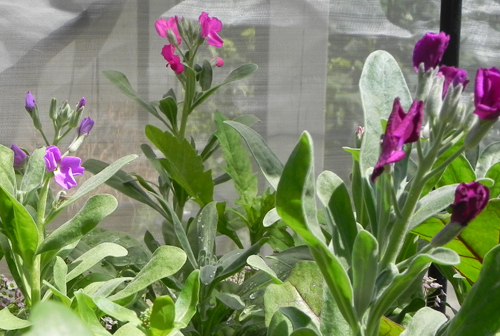 Like sweet peas, Matthiola incana prefers cool weather. I have just over a dozen plants, and they all seem to have single flowers, but they still have a nice carnation-like fragrance. They like to have good drainage and lots of sun, so I started them in flats and then moved many of them to my VegTrug in mid-April where they've been doing well. The rest are in my new south-facing raised bed next to the house. Because Matthiola incana is considered a biennial, I'm optimistic about them possibly setting seed that will sprout and overwinter to bloom again next spring. Alternatively, stock can also be started for fall bloom. I might not have to worry about going to the trouble if my little plants scatter their own seeds around.